1. Hangzhou Vision Chain Transmisison Co ltd. is UK- Investment Chain manufacture in Hangzhou, China, found in 2004. We have one Chain manufacturer and one Sprocket manufacturer. 2. 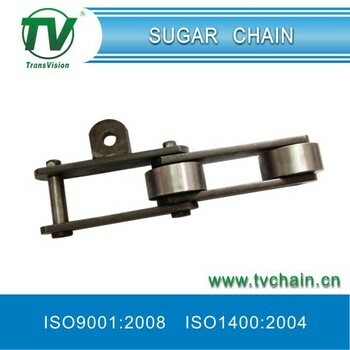 Qualified Alloy steel chain put our TV brand chain in the top quality level in China. We are honoured with ISO9001 ISO14001 AAA Credit certificate. 3. We have been producing all kinds of standard chains and special chain: Driving Chain, Agriculture Chain, Conveyor Chain, Long Pitch Conveyor Chain, Stainless Steel Chain, Hoisting Chain, Motorcycle Chain, Dropped Forged Rivetless Chain and so on. IF the order total account low than $1,000.00, we can accept payment by Paypal, Western Union, Moneygram and other quick payment. Chain wear life is typically 1.5% elongation (normal measurement 6-12) in the application of the drive, and 2% elongation in the transportation applications. Our chains can withstand up to 3% elongation, but this may damage the chain sprocket, overloaded, or increase the vibration and noise.